Outdoor living spaces offer extended comfort and functionality and encourage homeowners to spend more time enjoying the outdoors! There are numerous benefits of having an outdoor living space in Dallas and the Fort Worth Area. A well-designed patio can not only increase the value of your home, but it adds an extension to it. When opting for outdoor living design, you want to create an outdoor living space that is enjoyable and comforting. However, if we are being completely honest, nailing down a budget for your this project can be a real challenge. When planning a patio design project, there are so many factors which could affect the overall cost of completing your outdoor living space. At Compass Outdoor Design, we provide potential clients with free hardscape design consultations to give them a detailed estimation before beginning their project. If you are interested in the addition of an outdoor patio, outdoor kitchen, or an outdoor fireplace, use our budgeting guide to begin planning. The patio portion of any outdoor living space is generally the main piece to the entire area. At Compass Outdoor Design, we are able to extend the existing roof line to form the covering of your patio or build a new framed structure that attaches seamlessly to your home. Generally, installing an addition 200+ square feet, extending the existing roof line tied into the house with recessed lighting, fans, and audio-visual upgrades will cost an estimated $20,000+ depending on the size of the available space, upgrades and finishes, and site-specific requirements. Don’t forget about patio furniture, either. Similar to what it would cost to furnish your living room, outdoor living space furniture can range from $3,000 at the bare minimum to around $10,000 or more. Custom outdoor kitchens are perfect for the aspiring chef, grill master, or host. A typical outdoor kitchen design project includes a counter area, stacked stone, and stainless steel — such as a grill, refrigerator, or sink. Installing a welded frame, tile or stone veneer, three-centimeter granite countertops, and a selection of stainless appliances will roughly cost between $1,000-$1,500 per linear foot. An outdoor fireplace in Dallas / Fort Worth can be enjoyed year round. It can set the mood, create an aesthetically pleasing focal point, and help create the ideal spot to entertain guests within your outdoor living space. Most outdoor wood burning fireplaces built on site cost around $9,500+. 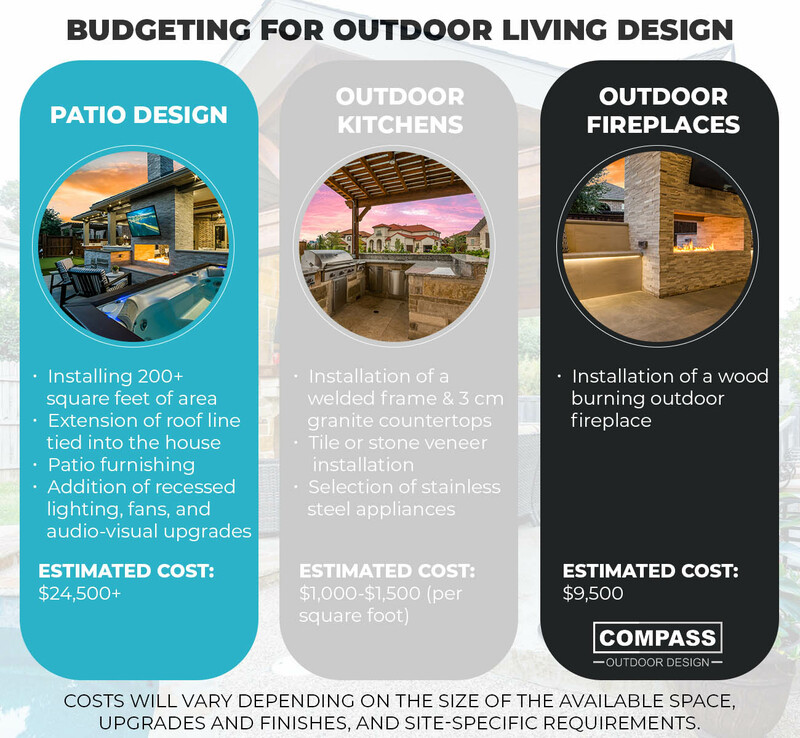 Before moving forward with an outdoor living space project, it is important to consider the added expenses of the additions to your patio design. Many homeowners already have a specific idea of what they want, which often requires additional work and materials. 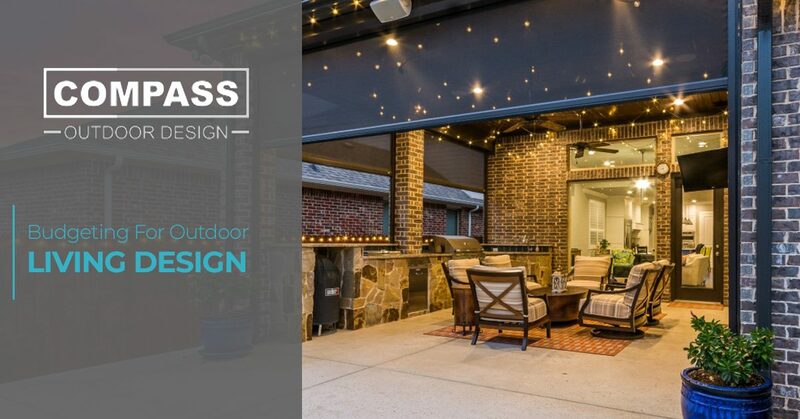 If you are planning your next outdoor living project, make sure reach out to the patio designers at Compass Outdoor Design. We specialize in creating beautiful, custom outdoor living spaces in Dallas and the Fort Worth Area. Our team works hard to design and build something that fits your style, your needs, and most importantly, your budget. To get an estimation of what your outdoor living project will cost, contact us to schedule a design consultation! ©2018 Compass Outdoor Design® - Do not copy. All rights reserved.